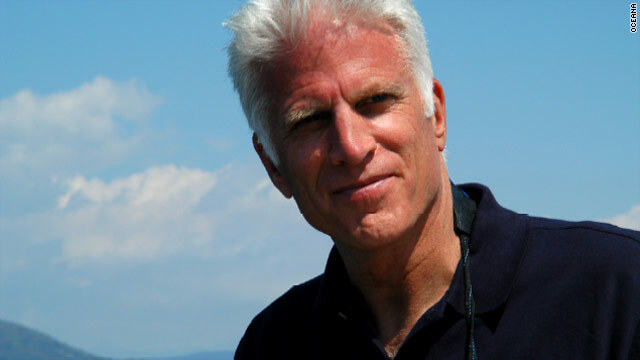 Ted Danson appeared in a live interview on CNN.com on April 1. Here the actor and environmentalist writes exclusively for CNN on his passion for the oceans and the need to protect them. (CNN) -- Looking out at the ocean, it's easy to feel small -- and to imagine all your troubles, suddenly insignificant, slipping away. Earth's seven oceans seem vast and impenetrable, but a closer look tells another story. A landmark study released by the University of California in 2008 revealed that just four percent of the world's oceans remain untouched by human activity. That includes fishing, pollution, climate change and more. I became interested in ocean issues in the 1980s when I couldn't take my daughters swimming because of pollution at our local beach. Twenty-five years later, I'm a board member of Oceana, the world's largest international organization dedicated to ocean conservation. According to research by Dr. Daniel Pauly, one of world's leading fisheries scientists and an Oceana board member, global seafood catch peaked in the late 1980s and has been declining ever since -- despite better and faster technology used to catch fish. The simple fact is that we've eaten a lot of the fish. The U.N. Food and Agricultural Organization says that 80 percent of seafood species are overexploited, fully exploited or recovering from depletion. This may seem hard to understand, given that grocery store shelves are stocked with fish every day. But consider this: over 80 percent of the seafood on American dinner plates is imported, much of it from poorer countries that now can no longer rely on the oceans to feed the local community and support the local economy. And massive government handouts -- to the tune of $20 billion a year -- support the enormous effort it takes to get that fish from the coast of western Africa, for example, to your dinner plate. Thanks to these government subsidies, the global fishing fleet is about two and a half times the size needed to fish sustainably. The industrial way we fish for seafood is harming the marine habitats that all ocean life depends upon. Indiscriminate commercial fishing practices that include miles of driftnets, longlines with thousands of lethal hooks and bottom trawls are ruining ocean ecosystems by killing non-seafood species, including sea turtles and marine mammals. Centuries-old habitats such as coral gardens are destroyed in an instant by bottom trawls, pulverized by weighted nets into barren plains. And global carbon dioxide emissions from human activity affect the ocean, changing the pH balance of the waters in a phenomenon known as ocean acidification. Increasing levels of carbon dioxide in our oceans will make it difficult for coral reefs, phytoplankton and shellfish to form their shells. This includes many animals that are the base of the marine food chain and therefore critical to the oceans' overall health. Coral reefs in particular, the nurseries of the seas and home to a quarter of all marine life, are already feeling the effects, and could be devastated by acidifying oceans. The good news is that are our oceans are remarkably resilient. Given a chance, they usually can bounce back, if we let them. At Oceana, we've already protected more than a million square miles of ocean from bottom trawling, and we've helped protect the U.S. Arctic from expanded commercial fishing. It's not too late to save the oceans. Let's be good stewards of our blue planet. Do you agree? Send in your comments in the Sound off box, below.